No matter what feature or amenity you are looking for in your vacation rental we have it! From properties with game rooms including pool tables, dart boards and more to motorcycle and pet-friendly properties you are sure to have whatever you need to make your vacation complete. Browse our specialized lists below. If you can't find what you are looking for contact our office, we will help get you into the rental of your dreams! 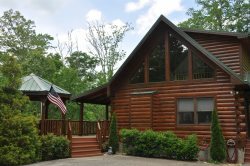 Incredible views, impressive architecture, and comfortable layouts - these vacation rentals are the perfect cabin getaway. Newly built you can be one of the first to stay at these mountain cabins with a hot tub, fireplace, grill, and fire pit. Enjoy the privacy of the surrounding forests and large decks great for entertaining. We provide great amenities such as the fully equipped kitchen to make vacationing easy. With endless outdoor activities just around the corner, these Northern Carolina vacation homes located in the Great Smoky Mountains are sure to make your stay memorable. Take advantage of the nearby attractions like lakes and rivers, fishing, hiking, and rafting, and more! There is nothing like a cabin overlooking the land - with large windows letting the light in. Sunset spent on the deck with a fire, or sunrise in the outdoor hot tub. The Great Smoky Mountains of North Carolina are the perfect backdrop for our beautiful vacation rental cabins. Perhaps you are looking to get away from the city to recharge - these scenic landscapes and fresh air will do the trick. We offer a variety of vacation rentals to meet your travel needs. Each cabin is unique, and we work hard to provide amenities that make your stay as relaxing as possible. The surrounding area is ripe with opportunities to explore and adventure. Check below to see our list of cabins with a view. Whether your cabin is on the creek or near a creek, they are perfect for the fisherman or nature enthusiast. They offer a serene setting for your Great Smoky Mountain vacation. For those of you who enjoy a good table game, many of our cabin rentals have game rooms and game tables to keep you entertained during your stay. With great games and plenty of nearby activities, our cabins offer fun for the whole family. Enjoy beautiful views, relax in the hot tub, and roast marshmallows around the fire. We offer a variety of options and even have cabins that can accommodate large groups. Each cabin is unique and provides an array of great amenities such as fully equipped kitchens, indoor fireplaces, pet-friendly cabins, and much more! When you are tired of board games, step outside into any one of the nearby activities like hiking, fishing, or rafting.